We are a Christian based program that ensures that God's word is incorporated throughout our day. We us the Jesus Story Book Bible curriculum in our preschool program. We feel it is important to not only incorporate it in our classroom but by also participating in chapel time each Wednesday. 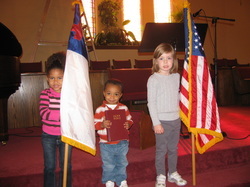 Chapel time starts with the pledge to the Christian flag, American flag and the Bible. We sing songs such as the B-I-B-L-E, Jesus Loves Me and many more. 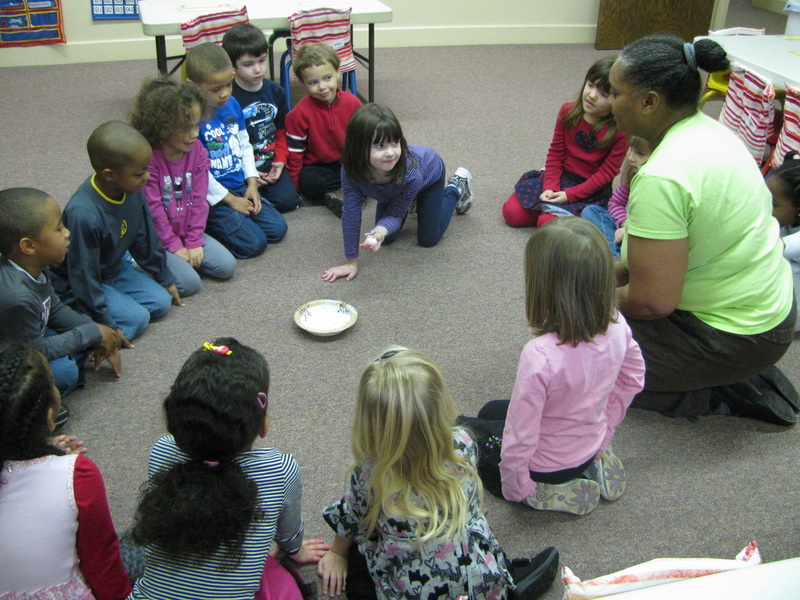 Each week, teachers lead the simple bible stories through books, roll playing, song, dance, and much more. Chapel time is fun and exciting! The two year old child thrives in the loving and warm atmosphere of this class. Combining predictable routines, language-building group times, and free play, that encourages experimentation, creates individual successes that promote confidence and self-esteem. Opportunities abound for learning letter/number/shape recognition, turn-taking, dramatic play, building friendships and developing self-help skills. This class has a 2:10 ratio with a lead teacher and an assistant. Students may attend two or four days. The three year old child blossoms and grows in our program. Teachers use the Read It Once Again curriculum which promotes and establishes an early literacy based foundation for the development of basic skills including cognitive, fine motor, gross motor, speech, adaptive skills and socialization. Students also work on writing their first name, letter recognition and numbers 1 - 20. 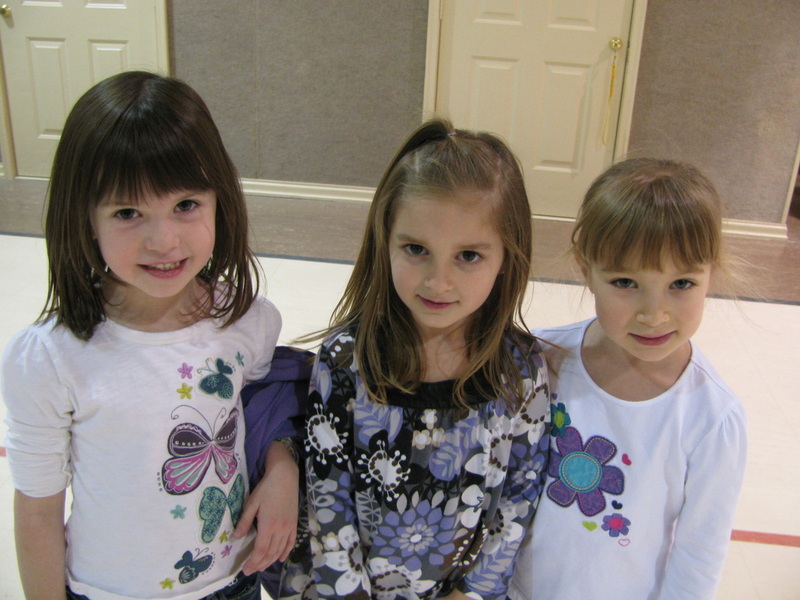 The three-year-old program has a ratio of 2:12 with a lead teacher and an assistant. Students may attend three or four days per week. Our PreK class promotes Kindergarten readiness. Our goal is to expose your child to what they will learn in Kindergarten so that when they attend Kindergarten, they can work to master those skills. Our four to five year olds are encouraged to discover literacy and writing, alphabet recognition and phonemic awareness. Each day provides time for art activities which utilize many different media and jointly encourages the growth of gross and fine motor muscles. Children experiment with basic math concepts such as sorting and patterning. The students develop self-help and socialization skills, decision making abilities and become confident learners. There is a 2:16 ratio with a lead teacher and an assistant. These classes are held Monday - Thursday with a Friday option. Our Fun Friday is all about learning through fun activities. We review the letters of the alphabet, numbers, colors, shapes, etc. all by playing games, engaging in hands on activities and through creative thinking. Snack and recess are still incorporated in our day. These classes are offered on Fridays from 9am until 12pm. Class size is 8 students and for students who are currently enrolled in our PreK class. Our school has a Developmental Checklist for each age group. We use these checklists as a guide in our teaching. The Teacher will complete a checklist for each student in December and May. The checklists are sent home to inform the parents of the skills that the child will willingly perform when asked by their teacher. Each week your child brings home a class newsletter, that informs you of the activities and events from the week. It will provide information such as letter, number and theme of the week, as well as special crafts and bible verse. Teachers also use this weekly newsletter to keep you up to date on classroom and school events, and special dates.